What About that Beautiful Bridge? The question is bound to come up for anyone looking at historic structures around Russian Gulch State Park. The bridge was designed by Henry E. Kuphal and built by a private contracting firm in 1939-1940. It was named the Frederick W. Panhorst Bridge in 1974, in honor of a long-time state engineer who specialized in bridges. The governor and lieutenant governor dedicated the bridge in ceremonies on June 9, 1940. It was completed soon after that. In December 1940, it was the cover subject of the magazine California Highways and Public Works,which was the official publication of the Division of Highways, California Department of Public Works. Click here to view the magazine's coverage of the dedication, and the December cover and article. 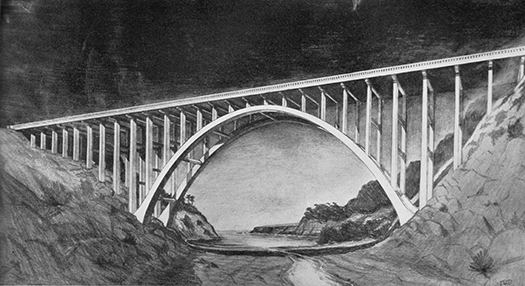 The rendering above was taken from the July 1940 California Highways and Public Works. 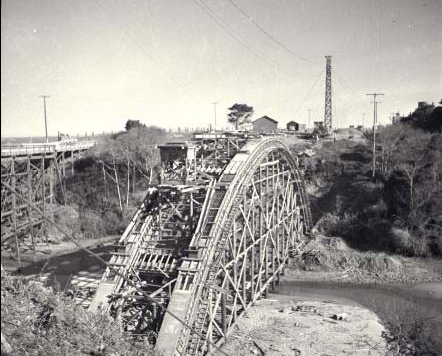 This 1938 photograph shows construction of the very similar arch bridge over Jug Handle Creek, about three miles north of Russian Gulch. The wooden trestle bridges along this stretch of coast could not support the weight of a modern vehicle. The highway division was replacing them one by one as funds were available. This bridge spans another California State Parks unit--Jug Handle State Natural Reserve.